It’s a bold statement that flies in the face of many articles written by others over the past five years and I might catch some flak for it, but it’s what I believe and I think the facts are on my side. 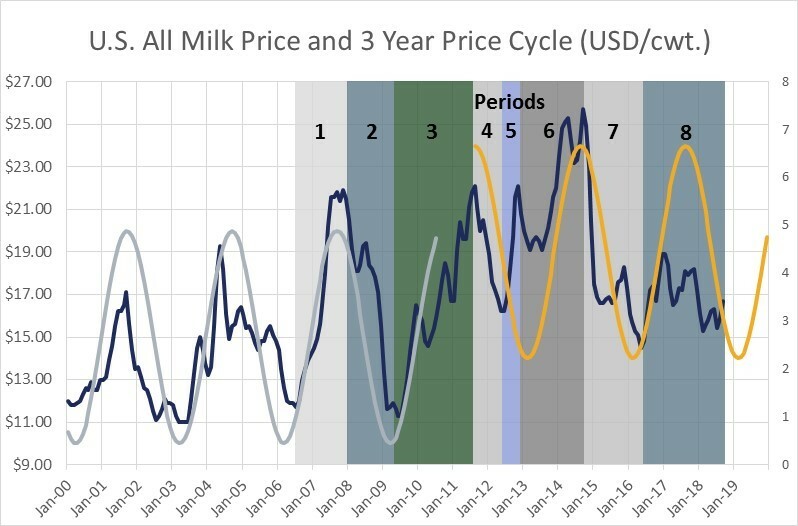 I don’t dispute that dairy prices happened to fluctuated on roughly a 3 year cycle for a period of time in the past, but my point is there is no reason to think that milk prices SHOULD fluctuate on a 3 year cycle and that it was actual contemporaneous supply and demand drivers that were impacting dairy prices during these ups and downs, not some mysterious 3 year cycle. What is the fundamental argument for a 3 year cycle? As far as I can tell those who have argued for the existence of a 3 year cycle cite the time that it takes to raise a replacement cow. Let’s say dairy prices are low in month number 1. Farmers hold onto fewer calves due to the low milk prices in month 1. It will take roughly 23-26 months to raise those calves, get them pregnant, and allow them to give birth before those calves start giving milk. So, the milk supply 2 years later will be tighter due to fewer replacement cows coming into the herd and that drives milk prices higher. Eventually the higher milk prices encourage farmers to hold onto more calves, which will boost the size of the herd down the road and push milk prices down and the cycle starts all over again. This would be an OK explanation for the observed 3 year price cycle if replacement cows were the only way to change milk production. 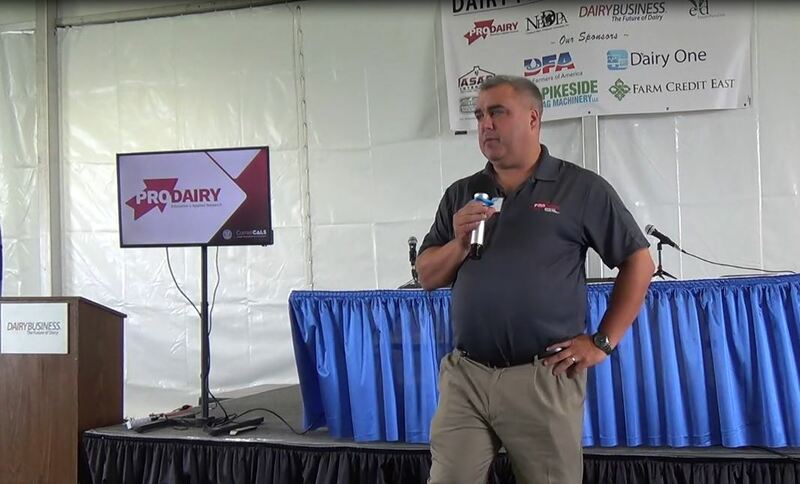 But it would still be a problematic explanation because it doesn’t take into account the huge impact that fluctuating feed costs, government policy and fluctuating demand have had on dairy prices in the past 20 years. Holding onto more or fewer calves is only one of the ways that a dairy farmer can adjust his production. Farmers can change the size of the herd through culling decisions too, keeping older cows around for another lactation if margins (or expected margins) are very good and they don’t have enough replacement cows coming into the herd. Dairy farmers can also adjust the rations that their feeding cows, juicing it up to get more milk out of the cows during periods of high prices and cheapening the ration in low price periods. So, the availability of replacement cows is not the only way to adjust milk production. On top of this, farmers are also adjusting production in response to feed costs and other costs of production, not just milk prices. 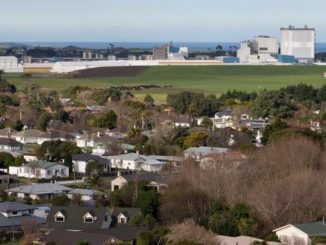 Then you also have weather that can drive better or worse-than-expected production, especially in New Zealand. Which brings up another point. The US is a part of a global dairy market where global supply and demand factors are driving prices, not just US supply. If we’re arguing that it is the availability of replacement cows that drives this cycle, then we have to argue that the cycle of replacement animals is synced up across all the major exporters. 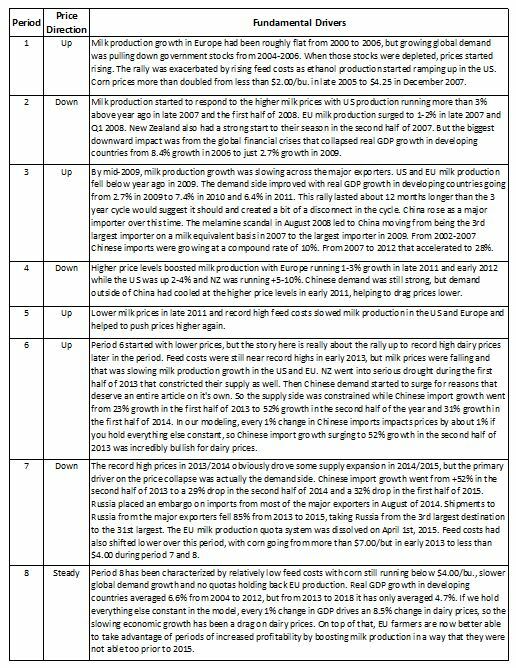 That might be true given the high level of correlation between milk prices across the major exporters, but it just adds to the list of restrictions and caveats that we need to adopt if we believe in the 3 year cycle. I think the biggest problem with the 3 year price cycle theory is ignoring the impact of demand and government policy. You could argue that the demand side is sort of built into the cycle. 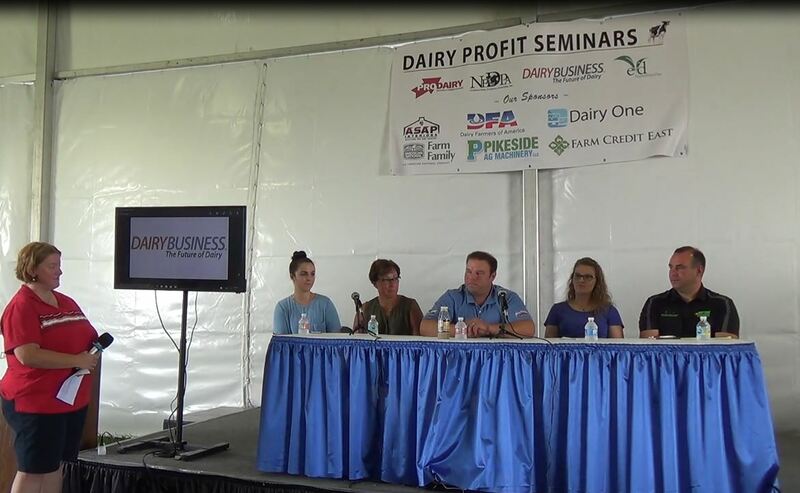 Dairy prices get high and that helps to boost milk production and also hurts demand, which pushes prices lower. Fair enough. But what about the sudden and large changes in demand that we’ve experienced in the past 10 years? The surge in Chinese imports in late 2013/early 2014. Russia’s embargo of imports from EU and other countries in 2014. Venezuela’s economic collapse and subsequent collapse of their dairy imports from 2015 to 2018. These weren’t the typical demand changes driven by prices. These were large demand shocks to the global system and had a significant impact on dairy prices. On the government policy side, the EU-28 removed their milk production quotas in early 2015, which has, and will continue to have an impact on global milk prices that can’t be accounted for in the 3 year price cycle story. It would be great if a 3 year cycle did exist. My job as a forecaster would be much easier. I could just look at the chart and see where we are in the cycle and make accurate predictions about future prices without worrying about all these supply and demand factors. It would also make it easy for everyone to get rich trading dairy futures. But anyone betting on significantly higher prices in 2017 or early 2018 due to the 3 year cycle was deeply disappointed. Dairy prices have gone up and down over the past 20 years, and if you squint hard enough, the peaks and valleys have roughly lined up roughly every 3 years. Was this due simply to the availability of replacement cows, or was it due to complicated and interconnected series of changes in global supply and demand driven by a diverse number of influences that just happened to result in a 3 year cycle for a period of time? You know where I stand on the issue. For more details and forecasts sign up for a free trial of our market intelligence service. 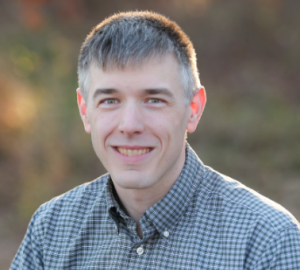 Editor’s Note: Nate is the Director of Dairy Market Insight at INTL FCStone Financial Inc. and has been applying his interest in large complicated systems and statistical analysis to the international and U.S. dairy markets since 2005. 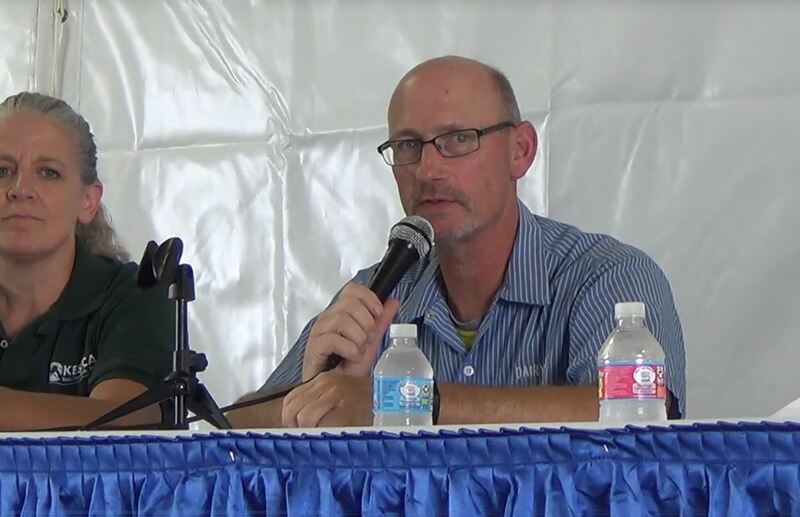 As a consultant, he has worked with clients at all levels of the dairy marketing chain from the farm level up to processors and packaged foods companies, food distributors and restaurants as well as connected industries like banks, private equity groups, government agencies, and industry associations. Through ongoing reports or one-off client specific projects, he helps them understand the short and long-term trends and the underlying relationships driving the market and what that means to their businesses. 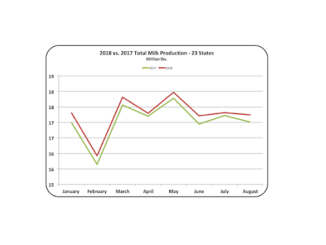 Class III and Class IV Milk Prices in Federal Orders: What’s Up?